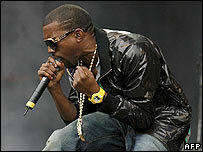 Rapper Kanye West has claimed his first UK number one single with Stronger. The US star, who has been performing at the V Festival this weekend, knocked Swedish singer Robyn from the top spot after a reign of just one week. In the album chart, Elvis Presley compilation The King entered at number one in the week marking the 30th anniversary of the singer's death. His song Suspicious Minds entered the singles chart at 11. It originally went to number two in 1969. Songs by Gym Class Heroes and Axwell Ft Max'C surged into the top 10, while David Guetta's dance track Love Is Gone climbed from 12 to number nine. Suburban Knights, the opening track from Hard-Fi's second album, landed in the countdown at 11. The band's debut, Stars of CCTV, was nominated for the 2005 Mercury Music Prize. Amy Winehouse's latest single, Tears Dry On Their Own, climbed from 24 to 16 in the week that the singer cancelled her appearance at the V Festival to address "health issues". 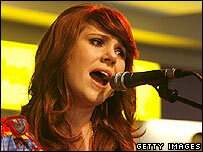 Elsewhere in the album chart, Kate Nash's Made of Bricks was relegated to the number two spot, while Winehouse's Back to Black climbed three places to number four. Wait For Me by the Pigeon Detectives registered the biggest surge, rising from 34 to number 11.